When I featured Licia Politis's incredible Quilled Day at the Races recently, I promised she would introduce us to the quilling tools that help her create such magic. Take it away, Licia! The wooden handled tool is the very first one I used when learning to quill. It has a small slot that doesn't go all the way through the metal shaft - this is a different feature than most slotted tools. The advantage is that it makes it possible to produce a coil with a clean, smooth center (i.e. no crimp), as long as you roll the tool a few extra revolutions after the coil end is glued. The other tool with the pink handle was homemade using a hair perm rod and tapestry needle, size 26. A hot air gun (embossing tool) was used to heat the pointed end of the needle, which was then carefully inserted into the plastic using pliers. The very tip of the eye of the needle was cut off, also with pliers, to create a slot where a strip is inserted. If the needle prongs are a little sharp, I file them on cement or bricks. Using this needle tool you certainly can get the crimped result if you allow it. With a bit of extra rolling though, the coil will release from the tool. 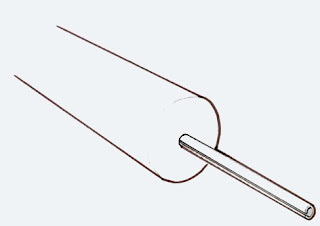 The pressure of the needle against the paper smooths the crimped end, making the center circular. When I start the strip in the needle, the paper is only just in the slot, not through the other side. This is important, as otherwise you won't be able to get the needle to release the paper when rolling those extra revolutions. It will also cause the fine needle to break, as the constant extra turns put a lot of pressure on it. I always miss an old, "broken-in" tool when a prong snaps! I use the perm rod needle tool more than the metal tool, but the metal one has been very useful over the years. Instead of a perm rod, the tapestry needle can be inserted into a wooden dowel, but the soft rod is more comfortable to grip. The needle attaches so much better to the hot plastic too, and stays in place, unlike the way it can loosen inside a dowel, rendering it useless. The slotted tool that Licia uses (slot doesn't go completely through the shaft) is available in Australia via Card Craft. Charli and Gene from the quilling supply site, Two Bad Dogs, in the U.S. offer a somewhat similar handmade tool in which the slot doesn't go completely across the shaft (pictured above). Denise at CustomQuilling, also in the U.S., has been working to have one produced. She's just waiting for the prototype so it can be tested. Thanks Licia, for sharing your tool tips with us! Awsome slotted tool, that really would make the center much nicer!!! thank you very much for sharing, Ann & Licia! Thank you so much Ann,for this most useful interview. I have been reading it over and over again. Tool with the slot not going all the way is something I am hearing for the first time. I prefer needle tool over slotted and this looks like such a clever idea. The pin with the slot that does not go all the way through can be purchased at most hardware stores. It is known by a few names depending on the area you live in, spring pin, roll pin or split pin. They come in various diameters and lengths. They are inexpensive so go ahead and buy a variety and chuck them into a pin vise handle as needed for a variety of projects. Karin, thanks for the info - that's very helpful! Thanks for giving us an inside look to your cool tools. Thanks Karin for adding more on it. On my xmas wish list now. So "easy" to please! Well i found this site about 4 days ago and I must say I adore it and I've tried making a quilled piece of my own and am having so much fun with it. Its the perfect way to decorate my home. Thanks a million for sharing.